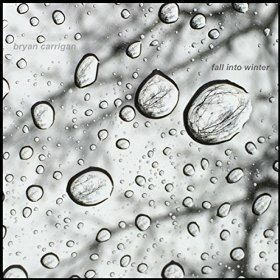 Bryan Carrigan has been building towards an album like Fall Into Winter for the last few years and I am happy to say that with the release of his latest project he has shown that his ambient sensibilities have been brought into sharp focus as he delivers a standout album that musically captures the shortening days of fall as they slowly turn into the cold darkness that is winter. While I am not a fan of the cold months of winter there is a lot to be said for experiencing the season vicariously through the music that Bryan has composed for Fall Into Winter. We are able to sit back in our comfy chair and be transported into a world that is so very familiar to those of us in the Northeast as we watch summer begin to turn chill, the leaves change colors and eventually fall from the trees as a sign that even colder weather and snow is going to arrive shortly. Bryan has captured some vignettes of this shifting of the seasons in the music he has composed for Fall Into Winter and I must say that he has done an excellent job of sonically painting the change of seasons onto the musical palette of his latest release. Fall into Winter features 12 tracks that run right around 73 minutes which makes this the perfect album for an extended outing into the colder portion of the year. Winter is not all about darkness, cold and endurance and that is why Fall into Winter is also about the childlike aspects of winter that can be found in all of us when we wake to see a heavy snow that has fallen overnight. Everything looks dreamy and beautiful as you gaze upon the untouched snow and we think back to our past when the only thing on our minds on a day like this was…snow day. No school and hours of time to explore the snow covered landscape that was created overnight courtesy of Mother Nature. As you might suspect the song called Snow Day on this album evokes that feeling of seeing the snow as an opportunity to play and have fun rather than as a burden that to most adults simply means shoveling, rough driving conditions and inconvenience as we go about our daily activities. With the sounds of children laughing and a simple fanciful melody Bryan’s song captures the essence of waking up to the “winter wonderland” of the first major snowfall and how it calls to the child in all of us to simply enjoy it as a gift and not to spend an inordinate amount of time worrying over all the adult consequences of heavy snow. It starts out with an almost music box like quality with the sounds of children laughing which transitions into reverberating tones that leaves the listener feeling comforted and happy in the knowledge that winter is still a childlike experience that we carry deep in our hearts buried under layers of adult responsibilities and coping mechanisms. The feel of Fall into Winter is a lot more winter than it is of the fall but I think that is still in keeping with the way we perceive the flow of time. The fall always seems to pass quickly as we race towards winter so it is fitting that the music that represents fall should not occupy much of the experience that is this new album. Bryan spent the last 2 years tweaking this album and working to make it a great portrayal of annual events that so many of us have fixed in our minds and he has done a great job of infusing the music with subtle yet emotional aspects of the approaching of winter during the fall and then moving through the winter months themselves. Judging by the song titles I would say that Fallen Leaves, The Calm Before and After the Rain give us a feel for the emotions of endings and preparing for a period of introspection in our lives as we approach the colder months. Fallen Leaves especially gives me this feeling with the simple keyboard arrangement that echoes through your thoughts in a reflective kind of way with a haunting melody that hovers over the landscape of your feelings as you walk through woods that are colorful but beginning to show signs of dormancy. The final track on this album is a marvelous triumph for Bryan as he finishes up with a 22 minute journey called Comparing Snowflakes. This piece is a perfect reflection of our world in the depths of winter when the pace of life slows down and we retreat indoors for the duration. This composition is a darker space than some of the other songs on this album and the music is shadowy and slow-moving allowing the listener plenty of time to enter in to this unhurried more meditative environment that is very indicative of this time of the year. To me this track is a representation of our perception of winter as feeling longer than say summer as we pass through the snow and ice and the cold on our journey to the next spring. Even though winter is no longer than the other seasons we tend to perceive it differently as Comparing Snowflakes illustrates so well. Most of us perceive the passage of time differently but for many of us the spring, the summer and the fall seem to fly by. Without realizing it the seasons are gone and we are left wondering what happened to the summer? How can it be gone so quickly? And yet winter seems to perceptually last forever once we are into the heart of the cold and the cycles of one snowstorm after another bearing down on us making even simple routines of going to work or the grocery store burdensome and difficult. While the track Snow Day celebrates the lighter, more enjoyable aspects of facing winter Comparing Snowflakes looks more at the perception of the length of the winter that many of us feel as we get into January and February. Bryan’s composition reflects that darkness that surrounds us as our journey becomes slower and more deliberate than the carefree days of spring or summer. Through the use of muted synth tones and deep sounds that resonates deep within the listener the music drifts and blows just like the powdery snow we see out our windows on a wintery day. Bryan is able to paint a picture with this composition that embodies not only the cold and the darkness that settles around us during the winter months but it also presents us with subtle hints of the peacefulness and the contemplative qualities of being in the midst of this season that slows us all down perhaps for the first time since warm weather returned earlier in the year. You will find much to love on Bryan’s 6th album as you are pulled into the quiet landscapes of fall and winter in a way that will leave you with a greater appreciation for the seasons that perhaps the listener has taken for granted for some time now. The album as a whole is a serene journey filled with sounds that are comfy and chill that shows that Bryan is ever evolving with his music and his ability to translate his inner vision into compositions that speak to the hearts of his listeners. While much of the music is more contemplative as is fitting for an album called Fall into Winter there are some bright spots on this album that are certainly some of my favorite compositions including Behind the Wall, Snow Day and Enchanted Cabin all of which seem to share a feeling of wonder in the midst of the chillier impressions that permeates the rest of the album. Winter has a duality about it that is the cold unrelenting fierceness of a winter blizzard and the childlike innocence that one feels when they walk out into the peacefulness of a fluffy new snowfall that muffles all the sounds of your environment and makes everything look wonderfully beautiful. Bryan has effectively captured both of these feelings on Fall into Winter with songs that conveys both emotions. All in all Fall into Winter is an excursion well worth taking and will be a rewarding experience to listeners who are already preparing for what lies directly ahead of us here in many parts of the United States. Recommended by Ambient Visions.